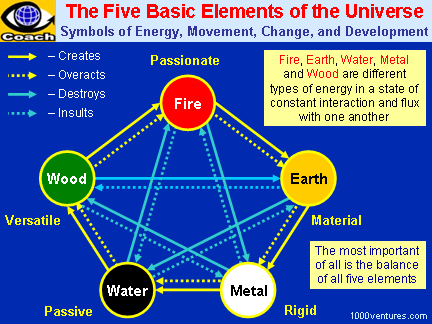 The Five Basic Elements are Fire, Earth, Water, Metal, and Wood. According to the ancient Chinese belief, those are the basic elements of the universe and everything in our word is a compound of the five elements. These elements are understood as different types of energy in a state of constant interaction and flux with one another. The Five Elements do not only mean Fire, Earth, Water, Metal, and Wood. They also mean Movement, Change, and Development. They are changing, moving, waning, and expanding all the time. The movements of five elements are stable and predictable when they are in balance, and vice versa. → Success is created by people working towards a shared vision in a balanced organization.